Here at Brock Doors and Windows we do our best to offer you only the highest quality windows at reasonable prices. You won’t find the experience we offer with anyone else. One of the ways we stand out from the competition is the fact that we take energy efficiency very seriously. 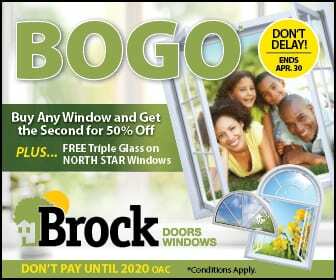 Any window contractor can claim to sell energy efficient products, but here at Brock, we don’t need to make claims. Our quality, energy efficient glass options speaks for themselves. Every single window we offer is Energy Star certified. This lets you choose the best Toronto windows for your home, and at the same time take advantage of any Energy Star financial incentives. It is a great time to be planning to upgrade your Toronto home with the latest superior window technology. Huge advancements in glass features and treatments have developed glass that is specially designed to fit your unique needs and preferences. Homeowners can get optimum performance and comfort out of their replacement windows when they install Low-E glass. In our Toronto climate, where both heating and cooling costs are a concern, Low-E (low emissive) glass holds the heat in during the winter and reflects it back outside during the summer heat. This makes Low-E an excellent choice to increase your comfort, savings and of course energy efficiency. Keep in mind that not only the type of glazing but also the number of glazing layers can have a big impact on your home’s energy efficiency. The three panes of glass are capable of keeping more heat in and cold out, which makes them the most energy efficient glass option on the market. Triple pane windows do have one disadvantage, which is their higher cost. Double-glazed windows can lower your solar gain by approximately 10%. Did you know that plain, clear glass lets the most solar energy into a building? Stop paying extra for your utility bills and give your Toronto home the gift of upgraded, energy efficient replacement windows. Tinted or Low-E glass windows from Brock Doors and Windows can help reduce your solar gains (and therefore your energy bills) by as much as one third. Here at Brock, we have all the options that will ensure that your home stays comfortable all year round, no matter what the weather’s like outside! Contact us today to schedule a free, no-pressure, in-home consultation. We will set a convenient time for you to come show you samples, gather measurements, and answer any questions you have. Best of all, you don’t have to wait to get a quote from us. We’ll give it to you right there on the spot!